The fifth of nine children, Fr. Hilton grew up in Boulder, CO. His college years were spent at Saint Thomas Seminary in Denver, followed by five years of graduate studies in Rome, Italy. Since his ordination in 1982 by Archbishop James Casey, Fr. 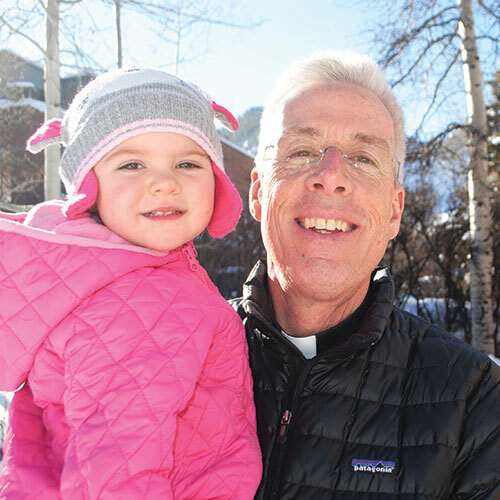 Hilton has served in a number of parishes in the Archdiocese of Denver and as Director of the Spirituality Year at Saint John Vianney Seminary in Denver. After serving as pastor at Holy Trinity Parish in Westminster, CO for eleven years, Fr. Hilton moved to Aspen in June 2011. Known as the “Pedaling Priest”, Fr. Hilton’s dedication to St. Mary’s is shown in all he does – from sharing his joyful wisdom to cycling cross-country in the summer of 2015.